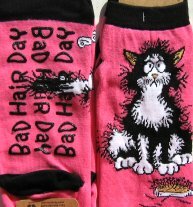 Here are cat socks you can wear around the house when having a "bad hair day". These cat slipper socks are made of 75% cotton, 15% nylon and 10% spandex. The soles of these socks have the words "Bad Hair Day" written in a non-slip material. Women's one size fits all.